‘Plant good trees on good land. There is something special about digging your hands into the soil, gently preparing the spot where a new tree will be planted to grow tall and strong, and bear delicious fruit to share with family and friends,” says Tom Burchell. For more than 75 years three generations of the Burchell family have been at the forefront of research and development of hundreds of varieties of fruit and nut trees. Irvin Burchell, the founder and patriarch of the family, believed that each tree and plant that bore the family name was a living promise made to their customers; that the investment they were making when buying them and then nurturing them needed to be worthy of their choice. His success is certainly a story of genetics, both through the painstaking research and development of each Burchell variety and also of the three generations of leadership of the company. Tom Burchell, who has led the company since 2005, may have inherited his traits of humility, positivity and perseverance, but he’s honed his skills through study and hard work. 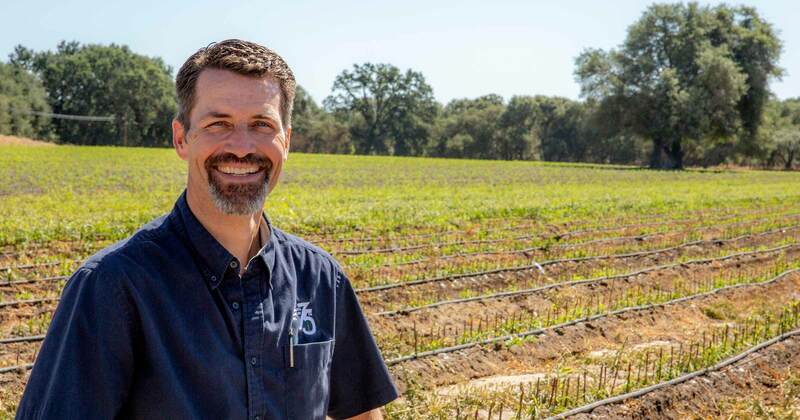 Holder of an Ornamental Horticulture degree from Cal Poly San Louis Obispo, Burchell initiated the product development division at Burchell Nursery, and now it collaborates with nurseries in Chile, Australia, South Africa and Europe. “While I’m proud of the nursery’s past, I’m focused on the future and how the nut breeding program can help farmers be ready for whatever it holds. This requires innovative thinking, but also takes daily diligence, as bringing new varieties to market is roughly a 10 year commitment.” says Burchell. But Burchell has the vision to focus on long-term goals (no surprise, he’s completed marathons, including running the Boston Marathon). In 2009 Burchell launched the retail division of the company, Tomorrow’s Harvest, for the home orchardist and gardener offering everything from fruit to nut trees, herbs to ornamentals, shrubs to strawberries, lingonberries to lavender all having been carefully cultivated. With the success of the Tomorrow’s Harvest® brand in retail stores across the country and online, Burchell sought to find a way to give back to the communities and to the people who had supported his business endeavors. “While on vacation, I began to think about the creation of what has become our Give & Grow Hope program,” says Burchell. For every Tomorrow’s Harvest tree purchased the company will donate a tree through its Give & Grow Hope organization to a deserving community group to provide access to fresh fruit, so people can enjoy delicious fruit-filled recipes like those Burchell enjoyed growing up. “My mom would call dad and he would be sure to fill a bag with peaches, plums or nectarines before heading home so my mom could make one of our favorite dessert, like Fresh Peach Pudding,” Burchell says.